In honor of today’s Mardi Gras celebration, I decided to make a traditional New Orleans specialty. This recipe comes from La Bonne Cuisine: Cooking New Orleans Style, compiled by the Women of All Saints’ Episcopal Church of New Orleans. It’s a fabulous cookbook, full of spicy, rich decadence – much like the Big Easy itself – and this recipe is no exception. It’s a bit higher in sodium than most of the recipes I post on The Daily Dish. Not TOO much, but enough to make you feel like you’re indulging. In honor of the occasion, I thought it made sense. Mardis Gras is all about indulgence, after all. Melt the butter in a large skillet or saute pan over medium heat. Add the garlic and green onion and saute until soft. Add the bay leaf, lemon juice, pepper, rosemary and 1/2 of the wine, and stir to combine. Simmer for 10 minutes. 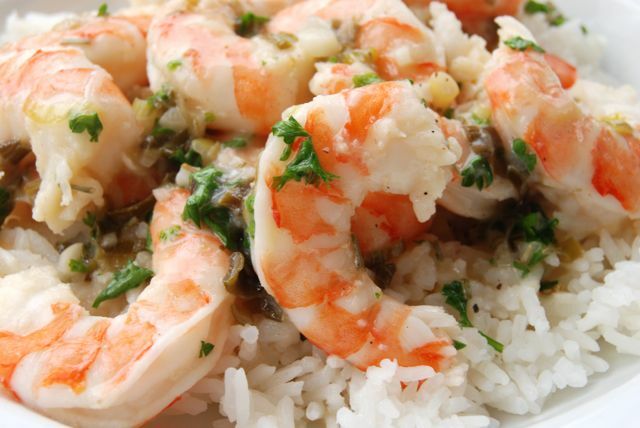 Remove the bay leaf, add the shrimp, and continue cooking for 20 minutes. Add the remaining wine and parsley, and stir to combine. Remove from heat and spoon over the cooked rice. Serve immediately.